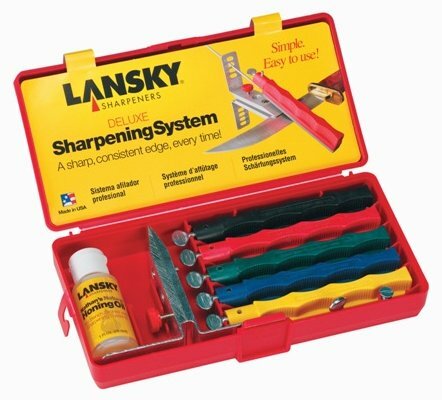 The Lansky Deluxe Sharpening System features a line of sharpening hones ranging from extra coarse to ultra fine. This is ideally suited for a wide range of sharpening tasks; enabling you to achieve a fine edge from the dullest of blades. The Lansky Deluxe Kit comes complete with extra coarse, coarse, medium, fine, ultra fine hones, multi angle knife clamp, honing oil, and 5 guide rods. All parts are contained in a custom molded storage case. Sharpening hones on color coded, finger grooved safety holders.